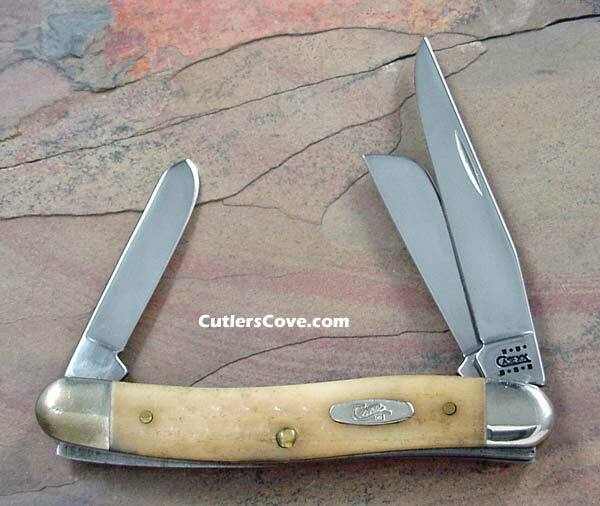 Case stockman with natural bone made in 2001 that is mint. 6318SS Pattern. 3-5/8” closed. Clip, spey and sheepsfoot blades. Case stockman with natural bone made in 2001 that is mint. 6318SS Pattern. 3-5/8” closed. Clip, spey and sheepsfoot blades. Corn Cob jigged bone handles and stainless blades. Extra hand finishing brings out the smooth silky feel of natural bone. Nickel silver bolsters & script style inlay shield. Really good looking handles. No longer made. The bolsters need to be polished. It had a list price of $61.95 back when it came out in 2001.